1918: Launched by Fellows & Co Ltd, Gt. Yarmouth (Yd.No.298) (wooden “Admiralty drifter”) for The Admiralty as ETESIAN (Ad.No.3885). 31.10.1918: Completed as a minesweeper (1 – 6pdr). 19.11.1920: Transferred to Ministry of Agriculture & Fisheries, London for disposal. 1920: Sold to Charles I. Chinery, Bangor, North Wales (John Robinson, Grimsby, manager). Registered at Beaumaris (BS26). 1921: Line fishing from Fleetwood (Alex Keay, manager). 1923: Sold to W. Flett, W. Slater & James Flett, Lossiemouth (James Flett managing owner). Beaumaris registry closed. Registered at Inverness (INS575). 12.1928: Sold to John & James Stephen, Carnbulg and Robert O. Stephen, Fraserburgh. 1929: Inverness registry closed. Registered at Fraserburgh as M. H. STEPHEN (FR17). 1939: Requisitioned for war as a minesweeping drifter (Hire rate £26.0.0d/month). 5.1941: Employed as an examination vessel. 12.1943: Employed on port duties. 194? : Sold to James Stephen, Carnbulg. 4.1944: Employed on miscellaneous Naval duties. 1945: Sold to J. M. Lovie, Fraserburgh. 1948: Sold to Alexander MacIver, Bayble, Christina Bruce & Others, Stornoway. 4q1948: Registered at Stornoway (SY789). 4.1949: Sold to J. & S. Cameron, Peterhead for breaking up. This entry was posted in Drifter/Trawler, Seasonal Visitors, Steam Trawlers and tagged Admiralty Drifter, Drifter/Trawler, No Fleetwood owners, Seasonal Visitors on May 13, 2012 by Fred Smith. 1918: Purchased by The Admiralty on the stocks. 1918: Launched by J. & G. Forbes, Sandhaven (Yd.No.168) (“non-standard Admiralty drifter”) for The Admiralty as FLAT CALM. 3.6.1918: Completed as a minesweeper (1-6pdr) (Ad.No.3890). 1930: De-commissioned and offered for sale. 3.1930: Sold to Alexander West, Gardenstown & others (Alexander West managing owner). 14.4.1930: Registered at Banff as ROWAN TREE (BF199). 11.2.1938: White fish trawling from Fleetwood (Alex Keay managing agent). Landed 24 boxes grossed £37. 24.4.1938: Last landing at Fleetwood, 145 boxes grossed £117. 1939: Sold to Mrs E. West, Gardenstown & others. 25.1.1940: Requisitioned for war service as a minesweeping drifter (Hire rate £26.0.0d/month). 21.11.1941: Sailed Lowestoft at 8.15 am and returning to port at about 3.00 pm struck shoulder of recently formed sand bank at the entrance. Lowestoft lifeboat MICHAEL STEPHEN (Cox Albert Spurgeon) launched at 3.30 approached and connected but line parted. Capsized when local tug had line connected, crew scrambling on to upturned hull. Cox Spurgeon took the MICHAEL STEPHEN alongside twice and took off all fifteen crew. Landed safely at Lowestoft. 12.1941: Banff registry closed declared a total loss. 04/05/2012: Page published. 6 updates since then. 08/12/2018: Removed FMHT watermark from image. This entry was posted in Lost Vessels, Seasonal Visitors, Steam Trawlers, Steamers (Picture) and tagged Lost, No Fleetwood owners, Seasonal Visitors on May 4, 2012 by Fred Smith. 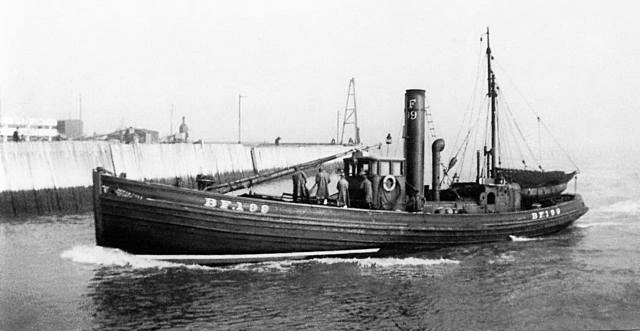 12.9.1905: Launched by Mackie & Thomson, Govan (Yd.No.312) for Hellyer’s Steam Fishing Co Ltd, Hull as AUDREY. 1.1906: Completed (Charles Hellyer, manager). 26.1.1906: Registered at Hull (H854). 16.4.1916: At Hull, Skipper Albert Menzies Johnston charged under the Defence of the Realm Act with being in a prohibited area and fined £50. 7.7.1916: Off North Coast of Scotland rescued all crew of the Swedish steamer LISA (1606grt/) damaged by mine and run ashore, landing them in Thurso Bay. Crew paid £100 for efforts in picking up survivors. 6.2.1919: Sold to Charles Henry George, Caister on Sea (managing owner). 11.12.1919: Registered at Gt. Yarmouth (YH215). 26.1.1920: Sold to John Halifax, Southtown, Gt. Yarmouth (managing owner). 1920’s: Seasonal fishing from Fleetwood (Sk. John Halifax). 11.1923: In River Yare in collision with steam drifter FAITHFUL (BK246) striking her amidships causing her to founder. 19.4.1926: Sold to Robert Boyle (32/64) and John Thomas Coulson (32/64), North Shields (Robert Boyle managing owner). 15.1.1926: Registered at North Shields (SN38). 20/02/2012: Page published. 5 updates since then. 05/01/2019: Removed FMHT watermark from image. This entry was posted in Lost Vessels, Seasonal Visitors, Steam Trawlers, Steamers (Picture) and tagged Lost, No Fleetwood owners, Seasonal Visitors on February 20, 2012 by Fred Smith. 1912: Launched by John Duthie Torry Shipbuilding Co, Aberdeen (Yd.No.377) for for George Addison, Cullen & others as THREE KINGS. 1912: Completed (George Addison managing owner). Registered at Banff (BF495). 5.1915: Requisitioned for war service as an A/S net drifter (1-6pdr) (Ad.No.2419). Based at Larne. 1916: Sold to Alexander Mair, Buckie & others (Alexander Mair managing owner). 1919: Returned to owner at Buckie (Jas. Archibold, Buckie). 29.5.1920: Sold to John Victor Breach (64/64), Lowestoft. John Victor Breach appointed managing owner. 29.5.1920: Sold to Jack Breach Ltd (64/64), Lowestoft. John Victor Breach appointed manager. 29.5.1920: Registered at Lowestoft (LT517). 9.6.1923: Stranded at Lerwick. Steam drifters EILEEN EMMA (LT342) and JUST REWARD (LT726) connected, refloated and returned to Lerwick. 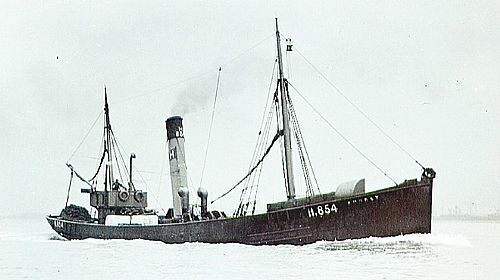 26.7.1925: With steam drifters TWO BOYS (LT1157) and UNITED FRIENDS (LT55) succeeded in refloating the Norwegian steamer GEZINA (1828grt/1917), which had stranded on Dennis Head, North Ronaldsay in dense fog. 12.6.1926: At Lerwick sustained damage in collision with steam drifter CLOVERDALE (BF170). 18.7.1928: At Stronsay, Orkney with broken propeller. 1930s: Seasonal white fish trawling from Fleetwood (Alex Keay managing agent). 13.8.1930: At Fraserburgh with broken propeller. 31.8.1934: At Workington (Sk. H. Stone) with broken propeller. 5.5.1936: With Sk. A. Catchpole, sustained damage in collision with steam drifter CLARA SUTTON (HL88). 15.11.1939: Requisitioned for war service as a minesweeping drifter (1-MG) (P.No.FY918) (Hire rate £27.0.0d/month). 1.1.1942: At Harwich LL sweep drifter (Hire rate increased to £27.013.6d/month). 1.1944: John Victor Breach died. 9.4.1944: Ronald H. Self appointed manager. 9.1944: Employed on miscellaneous Naval duties. 1945: Returned to owner. Laid up. 19.4.1945: Charles William Dance appointed manager. 26.7.1946: Jack Breach Ltd reconstituted as The Shoals Fishing Co Ltd, Lowestoft (Charles W. Dance, manager). 29.11.1946: Lowestoft fishing registry closed “No longer used for fishing”. 7.1947: Sold to Belgian principals for breaking up (Sanctioned by MOT letter No. GSP 6477 dated 9.7.1948). 14.6.1950: Lowestoft registry closed “Vessel broken up”. 20/09/2011: Page published. 6 updates since then. This entry was posted in Drifter/Trawler, Seasonal Visitors, Steam Trawlers and tagged Drifter/Trawler, No Fleetwood owners, Seasonal Visitors on September 20, 2011 by Fred Smith. 1909: Launched by Caledon Shipbuilding & Engineering Co Ltd, Dundee (Yd.No.201for George H. Hansell, Gt. Yarmouth as KING HERRING. 10.1909: Completed. George H. Hansell appointed managing owner. 18.11.1909: Registered at Yarmouth (YH7). 10.1915: Requisitioned for war service as an A/S net drifter (1-3pdr HA) (Ad.No.1922). Based Aegean Sea. 1919: Returned to owner at Gt. Yarmouth (George H. Hansell & John Thomas Cullen Salmon, Gt. Yarmouth). 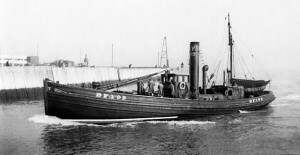 1919: Sold to Great Yarmouth Steam Trawlers Ltd, Gt. Yarmouth (George H. Hansell, manager). 1927: Sold to George H. Hansell, Gt. Yarmouth (managing owner). 1928: Sold to Sydney E. Catchpole, Pakefield (managing owner). 13.9.1928: Registered at Lowestoft (LT401). 1930/31: Seasonal whitefish trawling from Fleetwood. 1938: Sold to to Dutch principals for breaking up. 09/09/2011: Page published. 8 updates since then. This entry was posted in Drifter/Trawler, Seasonal Visitors, Steam Trawlers and tagged Drifter/Trawler, No Fleetwood owners, Seasonal Visitors on September 9, 2011 by Fred Smith.